Oldways makes understanding healthy eating easier, with the introduction of the Oldways Cart. Oldways makes eating healthy easy, thanks to the Oldways Cart meal plan. This graphic nutrition tool, inspired by the Oldways Common Ground Consensus of top nutrition experts, shows a shopping cart ﬁlled with a week’s worth of groceries for two adults. The accompanying downloadable shopping list and meal plan detail how this cartful of foods can be mixed and matched to make up a healthy diet, in line with consensus recommendations from leading scientists — including the Finding Common Ground experts and the 2015 Dietary Guidelines Advisory Committee. Food choices are mostly plant-based, but also include small amounts of meat and dairy. 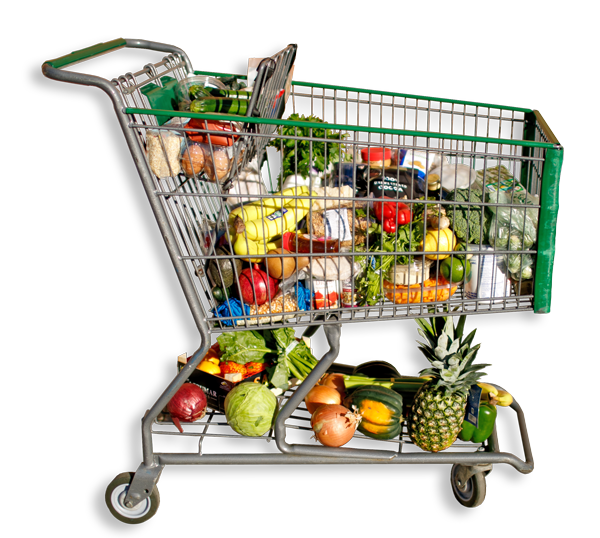 Whole foods, especially fruits, vegetables, legumes, and whole grains, ﬁll most of the cart. Fruits and vegetables can be fresh, frozen, or canned, to ﬁt every season or budget, and all foods pictured can be switched out for similar healthy choices – such as chard instead of spinach, or barley instead of bulgur – to account for personal tastes. Oldways staﬀ dietitian Kelly Toups, MLA, RD, who designed the meal plan, explained that all fresh foods in the sample 7-day meal plan “come out even,” with only shelf-stable pantry staples carried over to future meals. What’s more, simple recipes usually provide leftovers for the next day’s lunch. Although the Oldways Cart was designed to reﬂect the needs of two adults, Toups pointed out that its concepts can easily be scaled up for larger families. The Oldways Cart also demonstrates that eating well doesn’t need to be expensive. In January 2016, the foods consumed in the one-week Oldways Cart Meal Plan cost just $126.38 at a mainstream supermarket, putting the cost about halfway between USDA estimates for a “low cost” food budget and a “moderate” one — and well below the USDA’s “liberal plan” for two people. The Oldways Cart joins a long line of eﬀective, proven, nutrition education tools from Oldways, including the Mediterranean Diet Pyramid, the Whole Grain Stamp, A Taste of African Heritage cooking curriculum, and many more. For high-resolution images of the Oldways Cart and the foods in the cart, or for a copy of the Shopping List or 7-Day Oldways Cart Meal Plan, contact Kelly Grace Weaver, Director of Marketing and Communications, at kellygrace@oldwayspt.org. You can also download the Oldways Cart Shopping List & Meal Plan here.